Yellow National park is a total delight for the nature lovers and for the people who love the adventures, it’s a paradise. The park has the facilities for the visitors and offers the visitors to get engrossed totally in the beauty of the nature. Situated mostly in Wyoming, the park is spread in Montana and Idaho too. The park is atop a volcanic spot and is famous for the geyser, canyons, rivers and hot springs. If you are planning to visit this place make sure that you have a good amount of time in your hand, otherwise you are only going to regret later because only if you are at leisure you would be able to take part in the many activities and roam in and around the park and enjoy it to the fullest. Lets help you to prepare your itinerary for a great trip to the park. Check out the fascinating places you can visit while in the park and also the types of activities you can indulge in. The first thing you can do here is go on a visit to the Al-bright visitor centre. You can take the help of the ranger and explore the two storeyed exhibit areas. You can take a tour of the red roofed coloured building and understand the importance of the building that is still in use today (it is where the significant rules and regulation regarding the conversation policies came into existence). The Mammoth hot-spring is the major thermal area in the Yellowstone national park. Don’t forget to take a tour around the mesmerizing travertine terrace. Go hiking in the Mammoth’ area and indulge in a leisurely day hikes. You can plan for a day or extend it to more than a day with the help of the hiking guide. There are eight hikes selected by the park and you have the choice to select according to your liking. Keep yourself equipped with required food, drinking water, rain gears (the atmosphere keeps changing and you never know when the need arises), medicines and always make sure to inform about your day to the information activity centre. This road is worth a travel if you are looking to go the past. The road is open to hike; cars travel only one way while bikes can travel both ways. From here you can clearly see the Yellowstone River. You can also visit the heritage and research centre at Montana. The tower creek is formed by the eroded volcanic pinnacles. The Bannock fall on the Yellowstone River was the pathway for early Native Americans and European visitors. The view from the calcite spring is just wonderful and when you look a little further you can see the thermal features and the beautiful river flowing down. You can see the basalt cliffs, which are regarded as the remains of the earlier lava flow. There are several wild animals like sheep (bighorns), hawks, osprey and many who have made the cliff as their home. While you are in tower Roosevelt areas, take a look at the Yellowstone historic Buffalo ranch. You can also visit the Northeast entrance ranger station that is also a national historic landmark; the typical log construction you can see here is the characteristics common in the park structure of the west. It was once the way for the Native Americans to get access to their buffaloes. The trail goes a long way from blacktail plateau up to the Yellowstone River. The geological features here are diverse due to the volcanic eruption, glaciations and erosion. Three ranger stations namely Tower Junction, Lamar Buffalo Ranch, and North-east Entrance are located here and serve different purposes. Addresses the issues like back country and fishing permits. At the Buffalo Ranch in the Lamar Valley, provides emergency visitor services only. And the Northeast entrance is a historic landmark. Please note that it is too risky to go close to any wild animal here. Make sure you do not disturb any of the wildlife. Keep a distance of around 100 yards (bears and wolves) and 25 yards for others. Do not feed them. 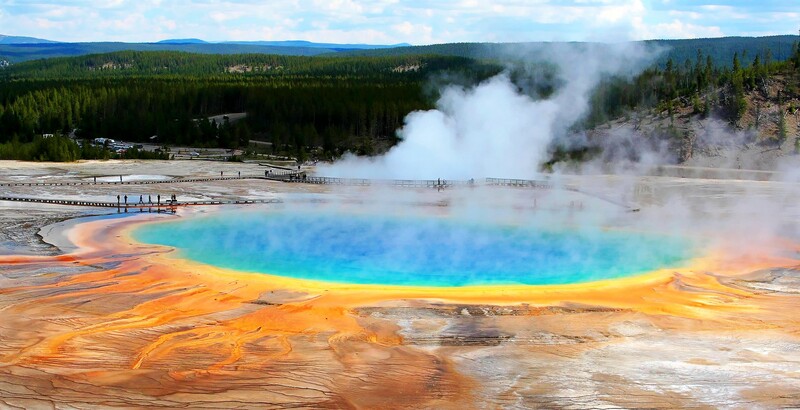 This is the oldest and hottest geyser basin in the Yellowstone park. There are only few thermal features at Norris under the temperature of 199 degree F. There has been the temperature record of 459 degree F at 326 meters below the surface area! This is an incredible sight to get soaked in. With the large and acidic thermal area that contains many steam vents, it is not-to- miss sight. The River flows from Wolf Lake and meets Firehole River at Madison to form the Madison River. Well, you can do your fishing activity only at the Gibbon fall. The Gibbon River forms the beautiful 60 feet waterfall called Virginia cascades. In winter the place is open for the skiing. The Norris museum: This log and stone building was constructed in 1929-30 and has set a benchmark for the parkitecture. You can see exhibits related to geothermal geology, Norris geyser basin features, life in thermal areas. The grand canyon made by the Yellowstone River measures around 20 miles from the upper fall to the tower fall area. The roads are good enough for the travel. A perfect place to admire the mighty canyon. The bears, bison, elk coyotes, etc. are often sighted here especially during the summer and spring. Birds like duck, geese, American Pelicans can be seen in mud flats at Alum creek. Mt. Washburn is a popular day hiking destination. The mountain is at the peak elevation of 10, 243 feet and so naturally the view from here is going to be breathtaking with a huge scope for the amazing panoramic sights. It is a national historic landmark and is located in the Madison junction in the picnic area. This wood and stone building is currently only a touch-table exhibit but there are further plans to install orientation panels. The lovely thermal area located just south of Norris junction is a must see place. Take a small tour to watch the hot spring, mud pots and the forest area that was burnt in 1988. You can also check for the Sylvan Springs, Gibbon Hill Geyser Basin, and Geyser Creek Thermal area, though they are considered pretty dangerous they can be accessed with the help of the learned personnel. Also visit the Gibbon falls, to treat yourself by taking a hiking trip to the mountain geyser basin; fish in the Madison river, where you can savour the fishing experience by catching the fishes like brown, rainbow trout and whitefish. You can also fish in the Firehole River; it is famous for the healthy brown, brook, rainbow trout and for its scenic beauty. Just north of Madison junction area provides a short walkway to the hot springs. When you are in the old faithful area the first place you would visit is the Old Faithful Inn. It is designed in such an atypical and asymmetry manner that it is surely going to catch your attention. The architecture wanted it to design it in such a way that it reflects the nature in true sense. The structure is made in log and denotes the parkitecture culture and is also one of the oldest log hotels in USA. If you are eager to learn about the Yellowstone and Old Faithful then you must take a visit to the Old Faithful visitor centre. The Yellowstone is home to number of geyser basin, and upper geyser basin has the largest number of this features. There are numerous small geysers, hot springs and also has a recent addition of mud pot. You can also go on exploring the fascinating midway and lower geyser basins. The main attraction here is witnessing the eruption of old faithful area. Take a guided tour or watch it on the webcam live. You can visit the west thumb geyser basin and when you are here don’t forget to go Potts basin in the north, the largest on the shore of the Yellowstone Lake. Visit grant village visitor centre where you can learn how fire is an important element in the environment and how important its role is. There is also a west thumb information station that is also called as Yellowstone association and serves as a sales outlet. It is turned into the warming hut during winter and otherwise it is the meeting place for the people during summer. The Yellowstone National park has so diversified climatic conditions and geological conditions that one can take into account number of different activities. The park has designated campsite system. You need permission to stay overnight and maximum stay per campsite varies. Permits are available from back-country offices located in most ranger stations or visitor centres. You can Plan your visit here. It can be undertaken in most of the lakes and on Lewis lake. Only non motorised boats are allowed and if you want to go for the motorised boat then you need to go to Lewis river channel. Personal water-crafts are strict no-no here. Check the boating regulations to know more about it. The bicycling is permitted here on the public road, parking areas, and designated routes and not allowed on back-country trails and board walks. You can also rent a bicycle from Xanterra Park in the Old Faithful area. Safety measures have to be taken care of while riding a bicycle. The National park and Xanterra park and resorts together have 12 campgrounds (around 2100 sites). You can make the reservation online or by calling or writing. Skiing and snowshoeing is one of the loved things to do when here but remember you are surrounded by the wild animals, moody climatic conditions, hydrothermal areas, deep snow and the dangerous avalanches so better be safe while venturing out. You can take relish the horseback ride and guided stock trip into the backcountry provided by Xanterra Park and resort. Wagon rides are also available for the visitors. Do make reservation arrangement beforehand. Also, there are numbers of picnic areas where you can sit, relax, barbecue but all in a day. Overnight stay is not allowed in the picnic areas. There are several businesses that offer their services for the above mentioned activities inside the park. Additionally, there are Ranger led programs including the interpretive programs, walks and talks programs in different locations. If you have children then let them enjoy the junior ranger program. If you are visiting the park in winter and want to have a guided tour then certainly you would need snowmobile or snowcoach. There is an option for you to choose from the Yellowstone permitted-commercial snowmobile and snowcoach guides or non-commercially guided with an approved BAT snowmobile. The Yellowstone National Park is a stunning place to be there and with the kind of activities and places to visit and wild life to watch for, I am sure you are not going to stay for just a day. So plan meticulously and enjoy to the fullest. You must check for the operating hours and season and plan things in advance to avoid any kind of disappointment. You can check the official site of Yellowstone National Park that can help you plan your trip.